The filesystem layout of the website can be shown by the diagram above. The basic page layout that will be used throughout the website. 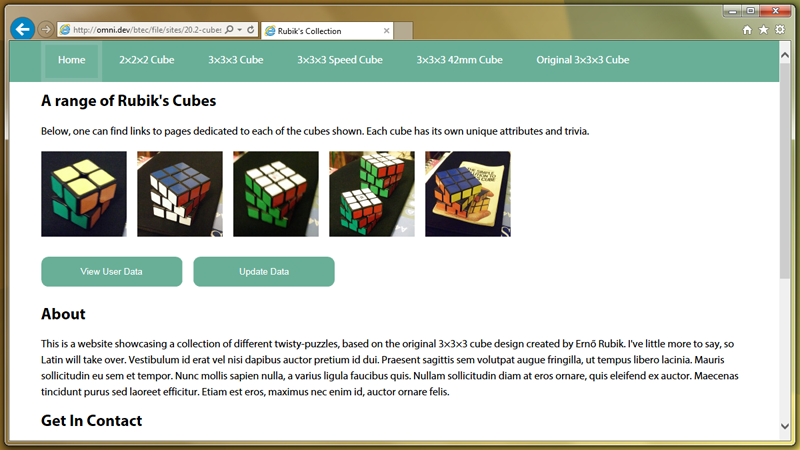 The page layout that will be used on the individual cube pages. 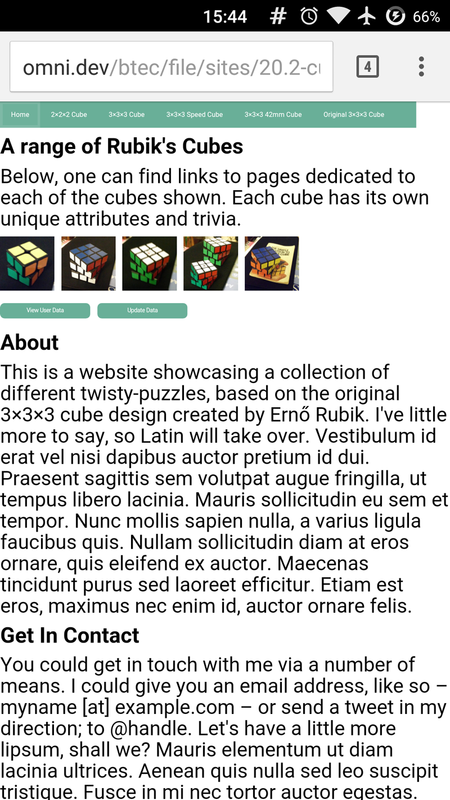 The page title will be a short description of the cube, the text content more details about the cube, and the image a full-size version of the relevant image shown on the home page. The website I created for this assignment can be viewed here. I made sure to follow HTML5 and CSS3 standards during the construction of the website. Following the current standards is an important responsibility of web developers, as they offer the most efficient methods of achieving certain goals and will theoretically offer the best compatibility between browsers. The source code of the website I created can be viewed using the developer tools in a modern browser (such as Mozilla Firefox), but it can also be viewed more easily online in its Git repository. When building websites, it's important to test not just the final product, but the components of the website as they are developed in different browsers and using different operating systems. As different browsers use different parsing software and – more importantly – rendering engines, single websites can potentially display differently in different environments. By understanding different platforms and their requirements, one can cater for most devices from the beginning of development, but some less-obvious caveats can drastically change a website in a way that'll only be noticed during testing. For a more complex website than that which I designed for the task, a testing grid would be suited to tracking the process of testing and tracking errors uncovered and confirmed in the website. For a website of the scale my own occupied there is little testing to carry out. The website consists of only two page layouts, both of which are greatly similar. Server-side programming or scripting hasn't been used to generate the website markup dynamically, leaving the website to pre-generated static content and the user-agent. Below I have summarised how the website created behaves in four major browsers, covering both desktop and mobile platforms. 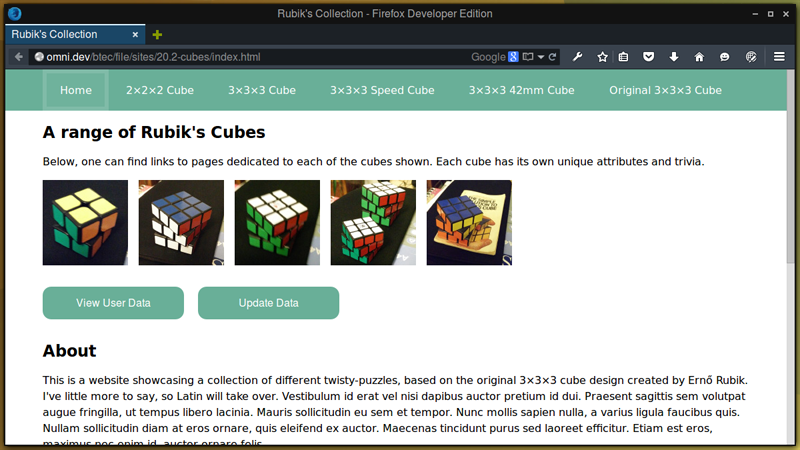 The website displayed as intended when using Firefox and a Linux operating system. The website displayed as intended when using Internet Explorer 11 and Windows 7. Internet Explorer running on Windows 7 also showed the website as intended. When viewing the website from a local drive, rather than from an HTTP(S) webserver, the browser would sometimes revert to the older IE 7 rendering engine. Using a slightly different DOCTYPE fixed this issue, but it can also be fixed with the addition of an extra meta tag telling the browser to render in its "Edge" mode. The website did not display well, through no fault of the browser, when using Google Chrome Mobile and CyanogenMod 12.1. 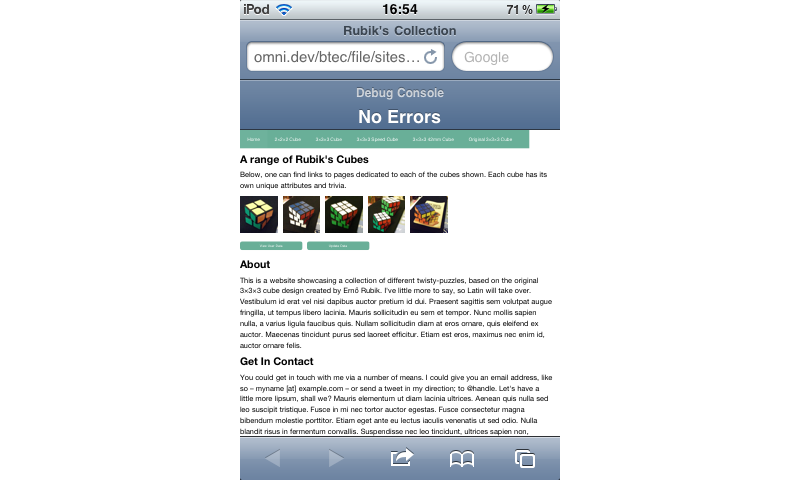 The website did not display well, through no fault of the browser, when using Mobile Safari and iOS 4.2.1.